In the 1990s, Bravo was a cable network that didn’t have a reputation. When my cable provider first began offering the network, it was not known as a haven for reality programming (such programming had hardly constituted a recognizable genre by that point—something like MTV’s The Real World still retained an aura of authenticity). Rather, it appealed to me because it seemed to buck popular orthodoxy. It showed old movies. As a teenager, my definition for “old” was clearly wanting: “old” meant anything made before I was born, meaning anything produced during the gray and obscure years of the early 1980s (or before). By this point, I was well on the path to cinephilia, despite not knowing the meaning of the word. What’s more, had I been accused of cinephilia, I would have probably giggled at the word’s seeming relation to necrophilia (though the cinephile and necrophile, I now understand, aren’t so far off: both have an irrational love for a dead object). The years 1998-2000 were key for my formation of an intellectual sensibility. I was ending middle school and starting high school. Some of my tastes remained resolutely and unapologetically populist: I believe I got a copy of Doom II that year, and remember wasting (was it wasting?) a large chunk of the car ride of our summer vacation from that year reading about episodes of The Simpsons. Back to Bravo. The network had something called “Five Star Cinema,” an on-going series of films that it showed with some frequency. I now understand that it was similar to Comedy Central’s strategy of programming movies, which meant leasing the rights to a few films at a time and showing them when other programming remained elusive. Comedy Central’s near-constant airing of PCU (1994), Johnny Dangerously (1984), and Monty Python and the Holy Grail (1975) had a big effect on me. But that is a post for a different day. Suffice it to say, “Five Star Cinema” represented a selection of films that hewed closer to what cinephiles traditionally define as their “good objects.” I first say Cinema Paradiso (1988) this way, and discovered what is, to this day, my favorite movie (Ken Russell’s Mahler ) thanks to “Five Star Cinema.” Though, I do remember seeing Monty Python’s Meaning of Life (1983) thanks to this strand of programming, so there was clearly someone with disreputable interests behind some of the decision making. 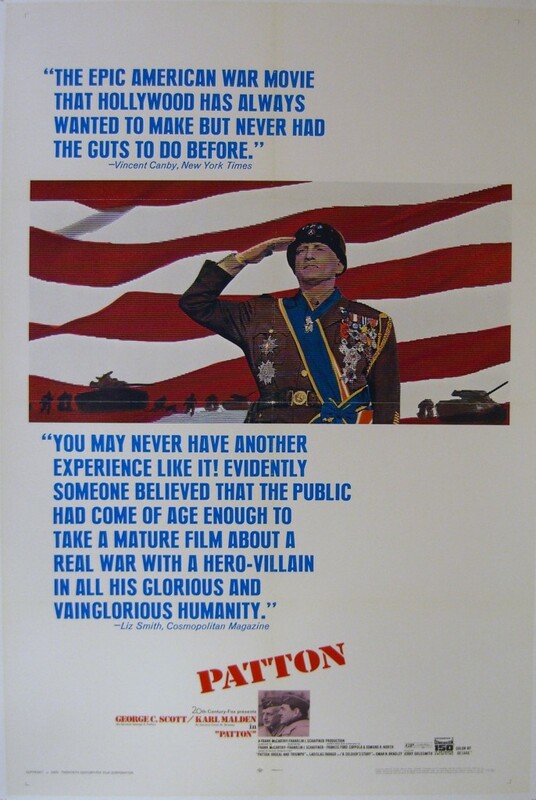 But I remember being flat-out shocked by my encounter with Patton (1970). Like most TV experiences, I came into Patton as it was already playing. I knew who the general was and I was vaguely aware of who George C. Scott was (was it because of a joke from The Simpsons? ), so it was not a total cold viewing. However, when I switched over, it was in the middle of the famous scene where Patton tours a field hospital. He enters a tent with wounded men, and begins talking to a shell-shocked soldier. My previous experience with war movies was one of a kind of sympathy between high ranking men and their subordinates. In my mind, Patton would lend a sympathetic ear, thus affirming the general goodness of the hierarchy. But the film has Patton slap the traumatized soldier, thus accusing him of faking an injury when so many others are hurt. Now, I was not (nor am I now) a combat veteran, but I knew that PTSD was a real thing. It had been heavily reported in the wake of the Gulf War, and it was to be the subject of much media attention after Bush Jr.’s war. So to see a high ranking general deny it was a true shock. But one that convinced me to see the rest of the movie. I managed to watch the whole thing at some point in the following weeks. While the slapping incident remains my true, mostly-out-of-context “First Encounter” with the film, other parts resonated. The famous speech in front of the gigantic flag was a piece of sincere pop art, the kind of thing that now seems to me like an image from William Klein’s Mr. Freedom (1969). My personal favorite scenes are the ones in which Patton brings his historical knowledge of military battles into his interpretations of the present. When Scott-as-Patton looks out over the potential battlefields of his conflict and synthesizes the ideas of Greeks and the Romans, I get a true sense of the representational roots of the genre.